To any one who has ever known Mr. STORM this very expressive and life like engraving will readily recall him to memory. Notwithstanding his apparent freshness and life he is believed to be, to-day, the oldest male representative of the STORM family in Dutchess County. His early and matured manhood were spent upon lands belonging to one of the old homesteads of the STORM family in EAST FISHKILL, where his younger son, William J. STORM now resides. The site of this old homestead still remains surrounded with trees that lift themselves toward the sunlight and hide in their branches the beautiful outlines of WICCOPEE, and the BEACON heights of the FISHKILL mountains, or HIGHLANDS, as their soft tracings of shadow and outline are spread out in the near and distant view until lost in the valley of the HUDSON. 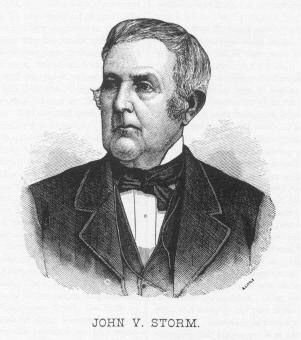 Here Abraham STORM was born October 1, 1772, and here his son, John V. STORM was born November 24, 1800, and was married to Jeannette E. WOOLLEY December 4, 1839. His life has been mainly spent upon a part of these ancestral acres, which he afterward inherited. Under the touch of his hand they assumed new forms of life, beauty and fertility, until even the passing stranger would be attracted by the neatness and precision of all their surroundings. His stables were filled with the finest horses in the country and his fields waved with the finest wheat that grew in the rich and beautiful valley of the FISHKILL. He held, too, positions of trust and responsibility. He was a Civil Magistrate for many years and also Supervisor of his native town, and at the organization of the FISHKILL SAVINGS BANK was director and the first president of that institution. Mr. STORM is descended from an old and now numerous family. He stands six generations removed from Derick STORM who came to this country in 1662, from the Mayory of Borch, in Holland, and is the federal head and representative of all who bear the STORM name in America. His wifes name was Maria Picters. He was at time schoolmaster and in 1670 was Secretary of BROOKLYN. He was town clerk of FLATBUSH, and was clerk of sessions in ORANGE County from 1691-1703. He owned land and paid taxes when Peter STUYVESANT was the Dutch Governor at NEW AMSTERDAM. He had sons Goris, Peter and David, and a daughter whose name was Maria. Goris married Engletie VAN LYCK, a daughter of Thomas VAN LYCK, of New Utrecht, and had sons Dirck, born 1695, and Thomas born 1697. Thomas STORM, grandson of the elder Dirck, and son Goris, purchased lands of Co. PHILLIPS, of the Manor of PHILLIPSBURGH, in Westchester county and resided at TARRYTOWN, where many of his descendants still live and where he is buried. He had seven sons and two daughters. Two of these sons died in early manhood, leaving children. By his will he gave to his grandson Abraham, son of Jacob, one hundred pounds. And he gave also to his grand-daughters, Christina and Anna, forty pounds. Besides Thomas and Jacob he had sons Garret, Goris, Abraham, John and Isaac. His two daughters names were Catherine and Engletie and his wifes name was Annie. To Garret and Goris he gave by will the lands which he purchased from Madam BRETT, in ROMBOUTS PRECINCT, being the first purchase, and lying on the north side of the FISHKILL, containing four hundred and six acres. To Garret he gave two hundred and four acres of these lands and to Goris he gave two hundred and two acres. To his son, Abraham he gave the lands of the second purchase, excepting ten acres, lying on the south side of the FISHKILL. And by his will he gave to his son Isaac his improvements in PHILLIPS MANOR. The two brother afterwards exchanged possessions and Isaac came to Fishkill. This will, now on record in the Surrogatess office of NEW YORK CITY, was made and executed in DUTCHESS COUNTY, being made no doubt, at a time when he was visiting his children. It was made on the 17th day of June, 1763, and probated before Bartholemew CRANNETT, in DUTCHESS COUNTY, on the 15th day of January 1770. One thing can here be said of these lands, that now, after a period of more than one hundred and forty years, scarce one acre of these lands has passed out of the family name. In so brief a paper as this only the shadow of an outline can be given of the STORM family. Mr. John V. STORM of the sixth generation now resides in FISHKILL village, still health and strong and in possession of his wonted vigorous faculties. He has three sons and four daughters. He elder son, Abram J. STORM, who is a large land holder and civil engineer in TEXAS, married to Miss Kate FOWLER, October 29, 1878. His second son, Joseph H. STORM, owning a large farm in GREEN HAVEN, DUTCHESS COUNTY, was married to Miss Sophia SHELDON September 4, 1867. William J. STORM was married to Miss Isabell HARPELL, October 11, 1872, he having two children, a son named HARPELL, and a daughter, Marguerite, Joseph STORM has two children, a son named Wilson and a daughter named Jeannette. His daughter Elizabeth, was married January 24, 1873, to Charles A. STORM of HOPEWELL. His elder daughter Sarah Frances, was married June 7, 1876, to Sylvester SOUTHARD, who have one child named Jane WOOLLEY SOUTHARD. They reside in FISHKILL. His youngest daughters, Helen and Cornelia STORM reside with their parents.